CES 2013 seems to come with lots of interesting innovations, among which there is the flexible display screen from Samsung. 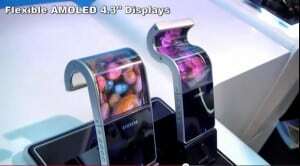 Samsung display, a Samsung subsidiary, will apparently show off their new bendable screens. They should come as a replacement for the currently used hard panel screens that phones, tablets and electronics use in present. The flexible display is not something we just hear about, as the new technology has been awaited for a while now. The flexible screens should be 5.5 inches for smartphones and with a resolution of 1289×720 with 267 ppi. The other screen they will show off is the 55 inch screen. Even though they have developed the flexible screens doesn’t mean they will also present flexible devices. . The screens are indeed flexible, but don’t expect you will go there and roll them entirely. The technology is still to be integrated with today’s uses such as the touch panel and so on. Today we have flexible screens, who knows what we’ll have tomorrow.